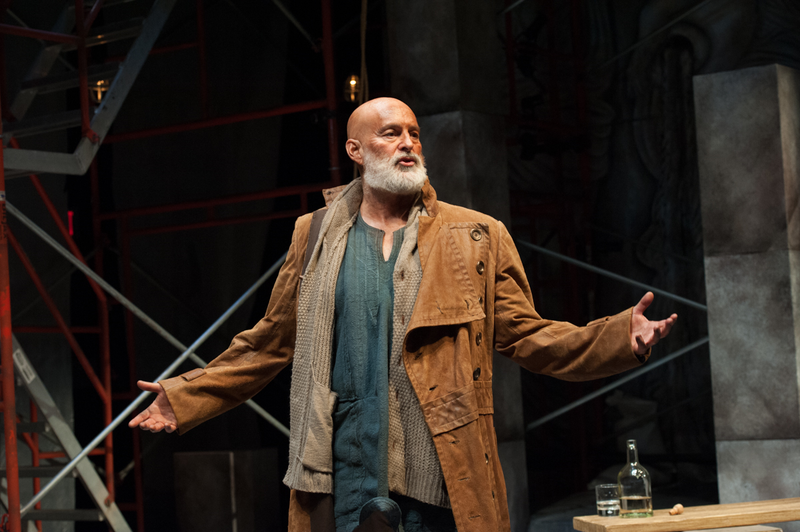 Stephen Yoakam (The Poet) in the Guthrie Theater’s production of An Iliad. Photo by Aaron Fenster. Homer’s the Iliad is among the oldest works of Western literature and its illumination of the heroism and horrors of war has resonated with listeners and readers throughout history. One of the most moving segments of An Iliad, now at the Guthrie Theater through May 26, was actor Stephen Yoakam’s minutes-long listing of every war in human history since the Trojan War. Based on Homer, the play merges the human and mythological events surrounding the siege of Troy, while weaving in modern references and vernacular. As The Poet, Yoakam delivers a virtuosic and powerful 90-minute performance, as the play’s single character. At the Dowling Studio, An Iliad makes use of the intimate space with an evocative ancient Greece-inspired set design by Michael Hoover. The play begins with Yoakam using the studio’s open lobby acoustics to sing an ancient Greek battle hymn: “Every time I sing this song, I hope it’s the last time.” Yoakam acts as both commentator and character: playing the Greek leader Agamemnon and the great warrior Achilles; narrating the death in battle of Achilles’ great friend Patroclus; describing the combat between Achilles and the Trojan hero Hector; and the final scene of redemption between Achilles and Hector’s grieving father. Throughout the play, The Poet addresses the audience, challenging us to acknowledge our own rage and complicity in creating wars and allowing us to mourn as innocent bystanders. The playwrights’ complex and ambitious merging of ancient and modern narratives hampers the clarity of the storyline and muddles its thematic exposition. Nor did they draw upon lessons learned from modern conflicts in Iraq and Afghanistan as much as I expected after reading the Guthrie’s synopsis. I also wondered why the director did not fully engage the music, sound effects and the set’s scaffolding until near the end of the play. Having a single actor carry such a heavy monologue without these devices might be asking too much. Yoakam delivers a spectacular performance despite these flaws. An Iliad, by Lisa Peterson and Denis O’Hare, adapted from Homer, directed by Benjamin McGovern, translation by Robert Fagles at the Guthrie Theater, 818 South 2nd Street, Minneapolis, MN 55415. May 4-26, 2013. Tickets $29-39 at http://www.guthrietheater.org/.